The biggest gap in the USA bat market was the light swinging performance bat. DeMarini fills that void with the 2019 Sabotage. The entirely new bat line comes in a drop 12 two piece (blue, grey and black) as well as a single piece drop 11 (red, grey and black) called the Sabotage One. We hit with these bats and measured their swing weights to gather enough data for this 2019 DeMarini Sabotage Bat Review. These bats are b… Jump to the full review. We aren’t the only ones to have information about the Sabatoge. Other places, in particular those who sell bats, usually have a boiler plate write up on the specs of a bat. Many of those we reference to make sure we are seeing what we should be. Here are some more references for the 2019 DeMarini Sabatoge review. The entirely new bat line comes in a drop 12 two piece (blue, grey and black) as well as a single piece drop 11 (red, grey and black) called the Sabotage One. We hit with these bats and measured their swing weights to gather enough data for this 2019 DeMarini Sabotage Bat Review. These bats are built for the hitter looking for an ultra light swing in the USA Bat space. The small 27-inch size swings extremely light (in either the Sabotage or Sabotage One). It is, to date, the lightest swinging USA Bat we have tested and we’ve tested a lot. Remember, the bats total weight has very little to do with their actual swing weight. You can’t weigh these bats on a kitchen scale and claim they swing a certain way. At their current price point you’ll need to pass on the 619 SOLO in a USA to go for the DeMarini Sabotage. The 619 Solo is far and away the most popular bat due, in part at least, its light swing weight and price point. But, it also swings a bit heavier than the Sabotage line. Add in the fact you get a smoother smash with the Sabotage and it could make sense for some. This bat is built for the player who needs the lightest swing possible, likes the feel of a two piece bat for hand sting (a good idea t this page) and loves DeMarini. They also should not be too concerned with barrel sizes. The price is pretty aggressive for a pretty simple bat, but it is what it is. The light swinging USA Bat space, at least in 2018, was far and few between. Bats like the 618 Solo from Slugger and the Rawlings Threat were the only two options—and the USA 618 absolutely killed it. We expect a ton more options in the light swinging 2019 USA Bat world. Some of that will be filled with the two bats we are discussing here: The Sabotage and the Sabotage One. At this point, both bats don’t have real close comparison. A drop 12 USA Bat build like a Hybrid? No such thing as of now (aside from the 619 Solo–sort of). A single piece aluminum drop 11 in the single piece aluminum in a USA Bat Model? Again, the 619 is where it is at. But all those bats have a 2 5/8 version. This bat is a 2 3/8. We took the 2019 Slugger 619 bat in a few different sizes to the fields and cage. We put several hundred swings on the 2018 Rawlings Threat USA Bat. 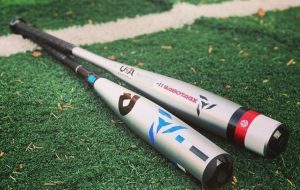 The USSSA and BBCOR versions are reviewed here too, but they are significantly different in makeup when compared to the 2019 USA Rawlings Threat. In their construction, the Sabotage One is a single piece aluminum bat while the Sabatoge is a two piece hybrid bat. Hybrid bats, you should know, are two piece bats built with a composite handle and an aluminum barrel. The Sabotage One is marked as a drop 11 while the Sabotage is a drop 12. Our swing weight tests showed they swing very similarly. At release the One is about $50 less than the Sabotage. In terms of overall performance the bats barrels are exactly the same. What you will get is a bit of a smoother smash on the two piece hybrid Sabotage over the One. But, if your player is not seeing remarkable pitch speeds—or they don’t have a serious amount of bat speed—then that might not matter much. In those cases, like the hitter in the video, we suggest saving the $50. If you player plays a lot of baseball and sees higher pitch speeds we’d guess they will like the two piece hybrid Sabotage better. The Sabotage line uses a 2 3/8 barrel diameter—this compared to the 2 5/8 allowable USA standard. They are, as far as we can tell, the only bats ever created with a 2 3/8 barrel. We’ve heard these smaller barrels referred to as aerodynamic. With all respect, we can just see a marketing team sitting in some board room trying to explain away the reason their barrels are 1/4 of an inch smaller in diameter then many others in the market. We have to laugh at the solution. I think we would be better off if we just call it what it is: If you want the lightest swinging bat in the USA performance space you must sacrifice something. In this case it is a 1/4-inch of a barrel. That’s reasonable. How much does a 1/4 inch of a barrel affect your ability to find a pitch? Maybe some, but its far from a lot. And, the ultra light swing weight might give you more bat control to find the pitch. 1/4 barrel profile is far from a huge reason to not buy a bat. The Sabotage and Sabotage one come in a 27 to 31 inch length. Also, note, the barrel sizes on these bats are 2 3/8 instead of the max allowable 2 5/8. So what were your measured swing weights? In the swing weight section or on the raw exit speed page.